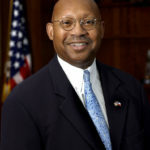 Alphonso Jackson served as the 13th United States Secretary of Housing and Urban Development (HUD). He was nominated by President George W.Bush on January 28, 2004 and confirmed by the Senate on March 31, 2004. Jackson announced his resignation on March 31, 2008. "In 1965, I marched for equality." "And what most people don’t understand is the bulk of business in this country is small business." "The dream doesn’t lie in victimization or blame; it lies in hard work, determination and a good education." "Progress for black Americans depends on good schools because education is the last great equalizer."